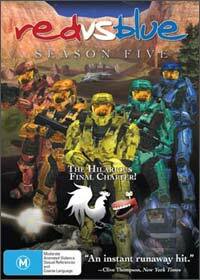 The highly popular internet "TV" series Red vs. Blue arrives on DVD that contains episodes number 70 to 100 and finally ends the saga of the Blood Gulch Chronicles and picks up from the cliff hanger ending of Season Four. In the last season, Tucker was pregnant with an alien child and Tex had left in search of a rival and once again those crazy writers at Rooster Teeth create a truly unique tale that is filled with humour, humour and more humour. Also a healthy dose of action! This season once again sees the return of some "known" characters from the previous seasons and adds a variety of twists and turns to the final series with a healthy amount of humour and adventure... as much as the Halo 2 engine can create but this is what Red vs. Blue is all about, a group of soldiers trying to do their jobs in a world gone crazy. As the Red and Blue armies are about to come to a head over a worthless piece of real estate, a box canyon in the middle of know where, everything comes together perfectly in an ending that will not only shock but will please fans all around the world. Some of the battles are extremely well created that do pay homage to the original game which this series is based on and at times, it's almost like watching a professional production. Vic's jingle from the previous series is still present in the season five and is an entertaining as it was when we first heard it. It's cliché, it's pop culture and Red vs. Blue is definitely one for the fans of Halo and Halo 2... or for those that enjoy strange humour!